Available in just about any color you might possibly want a camera in (Olive Green, Beige, Chocolate, Pink, Bright Blue, Green, Orange, Purple, Black, White, Navy, and Red), the Pentax K-x series is a compact entry-level DSLR, offering far more sophisticated shooting and customization options than point and shoots and megazooms. The K-x measures 4.8" by 3.6" by 2.7", making it considerably larger than a point and shoot but not especially large when compared to other DSLRs. It will, however, likely require its own case and won't fit comfortably in a pants or coat pocket for easy shooting. The camera has a CMOS type sensor with a primary color filter and a shake/dust reduction sensor-movement system to help maintain image quality. The sensor measures 23.6 by 15.8mm and offers color depths of 8 bits per channel in JPEG and 12 bits per channel in RAW. Its total pixel size is 12.9 megapixels and its effective pixel size is 12.4 megapixels. It can capture still images at a maximum resolution of 4288 by 2848 and videos at a maximum resolution of 1280 by 720 at 24 frames per second. It also includes a dust alert to inform you if dust is an issue inside of the camera. 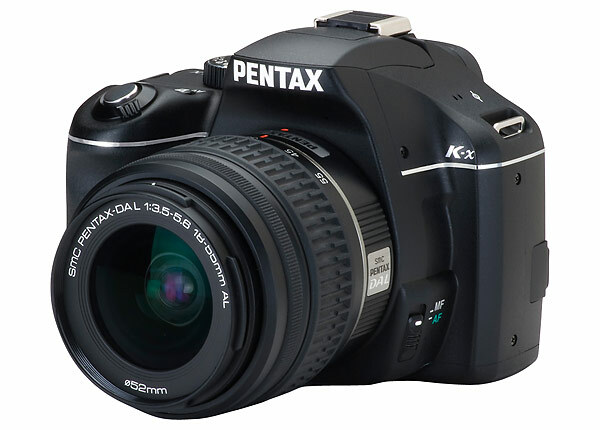 The camera's lens mount is a Pentax KAF2 stainless steel mount compatible with Pentax KAF3, KAF2, KAF, and KA lenses. It includes an SDM function and does not have a power zoom. Its focus system is a TTL phase-matching 11-point wide autofocus system that supports Single focus, Continuous focus, Kids, Pets, Stage Lighting, Night Snap, and manual adjustments. The camera can be set to 11-point automatic adjustments, 5-point automatic adjustments, point select, or center/spot adjustment. The built-inflash provides assistance. The camera has a pentamirror viewfinder with 96% coverage. It magnifies at approximately .85x and has a natural-brght-matte II standard focusing screen. Diopter adjustment can be set between -2.5 and 1.5 and the depth of field preview can be set between optical and digital. The camera also has a 2.7" TFT color LCD with a resolution of 230000 dots and wide-angle view support. Live view is performed through TTL and offers 100% field of view as several view options and contrast-based autofocus. The camera has a retractable p-ttl auto/manual flash that can be set to 100/m or 200/m. It provides 25mm wide angle coverage and many flash modes, including on, off, redeye, slow sync, slow sync with redeye, slow sync with trailing curtain, and wireless. Exposure compensation can be set between -2 and 1 EV in 1/2 steps. The camera's external flash operates wirelessly at a speed of 1/180s. The camera has no internal memory and supports SD and SDHC memory cards. It has a USB 2.0 port and an AV out with support for NTSC and PAL video, but no support for printers or PictBridge. The camera takes its power from 4 AA-sized batteries (lithium, NiMH, or alkaline) and can take approximately 1900 images between charges or playback approximately 680 minutes of images. An optional AC adapter is also available. The camera has a sensor-shift shake reduction image stabilization system and a 16-segment, TTL open aperture metering system. Its range is between 1 and 21.5 EVs, but can also be set to multi-segment, center weighted, or spot metering. Compensation can be set between -3 and +3 EVs in (1/2 or 1/3 steps). The camera's ISO sensitivity can be set automatically or manually between ISO 200 and ISO 6400 and can be expanded to between 100 and 12800. White balancing can be set to automatic, daylight, shade, cloudy, fluorescent, tungsten, flash, or CTE. It can also be set manually. The camera's capture modes include auto picture, program, sensitivity priority, shutter priority, aperture priority, metered manual, bulb, and movie. There are many custom image modes, digital filters (toy camera, high contrast, soft, starburst, retro, color extract, fisheye, custom), drive modes (single, continuous, 12 or 2-second self timer, 0 or 3-second remote, auto bracket, HDR capture, multi-exposure, and continuous shooting at 4.7 frames per second). The camera saves images in the RAW or JPG formats. It stores movies in the AVI motion JPG format. The camera does not include an HD video output, requiring that you use another device to watch HD videos captured with this camera. That's way more clerve than I was expecting. Thanks! The camera is compatible with K-series lenses, a variety of batteries. The camera's focus screen can be replaced, though Pentax does not support this.